To mark her 65th coronation jubilee, this year, the Queen of Great Britain and Irland explain her coronation jewel…. The St Edward’s Crown was used by Archbishop of Canterbury at actual moment of the monarch’s coronation. Queen Elizabeth swapped crown for lighter Imperial State Crown before leaving Westminster Abbey on the day of her coronation. What’s about the large Spinel which she love? 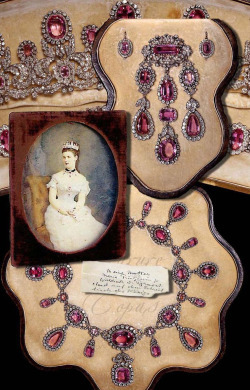 The Black Prince’s Ruby is a large, irregular cabochon red spinel weighing 170 carats (34 g) set in the cross pattée above the Cullinan II at the front of the Imperial State Crown of England. The spinel is one of the oldest parts of the Crown Jewels of the United Kingdom, with a history dating back to the middle of the 14th century. It has been in the possession of England’s rulers since it was given in 1367 to its namesake, Edward of Woodstock (the „Black Prince“). In its history the stone, of Eastern origins, was pierced for use as a pendant, and the upper hole later plugged with a small cabochon ruby in a gold slip mount. Given to Edward, Prince of Wales (1330-76), son of Edward III, and known as the Black Prince, by Don Pedro, King of Castile, after the Battle of Najera near Vittoria in 1367. According to legend it passed to Spain in about 1366, where Don Pedro took it from the Moorish king of Granada. In 1415 it was one of the stones worn by Henry V in his helmet, at the Battle of Agincourt. It is difficult to prove that this is indeed the same stone but a large Balas (= spinel) certainly appears in the descriptions of historic state crowns, and it has been reset each time the crown was refashioned. In 1820, the gemstone was valued at £10,000 equivalent to £10,000,000 as of 2016. 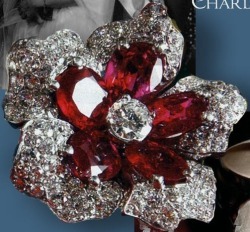 2868 diamonds in silver mounts, largely table-, rose- and brilliant-cut. 17 sapphires, 11 emeralds and 269 pearls. 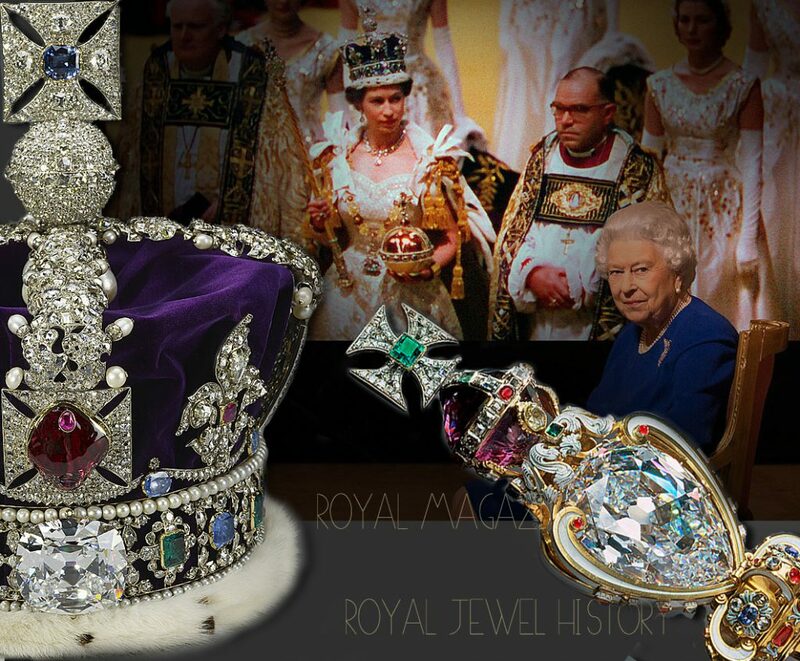 At the front of the crown band is the large cushion-shaped brilliant, Cullinan II, the second largest stone cut from the Cullianan Diamond (also known as the Second Star of Africa). 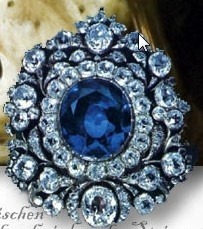 At the back of the band is the large oval sapphire known as the ‚Stuart Sapphire‘. The two large stones are linked by an openwork frieze, containing eight step-cut emeralds and eight sapphires, between two rows of pearls. The remaining three crosses are each mounted with a step-cut emerald mounted as a lozenge. The crosses alternate with four fleurs-de-lis, each with a mixed-cut ruby in the centre. Both crosses and fleurs-de-lis are further mounted with diamonds. The crosses and fleurs-de-lis are linked by swags of diamonds, supported on sapphires. The arches are cast as oak leaves, set with diamonds, each having paired pearl acorns in diamond cups projecting from the sides. At the intersection of the arches are suspended four large pear-shaped pearls in rose-diamond caps, known as ‚Queen Elizabeth’s Earrings‘. The arches are surmounted by a monde of fretted silver, pavé-set with brilliants, with a cross-pattée above, set in the centre with an octagonal rose-cut sapphire known as ‚St Edward’s Sapphire‘. The Imperial State Crown, or Crown of State, is the crown the monarch exchanges for St Edward’s Crown at the end of the coronation ceremony. Before the Civil War the ancient coronation crown was always kept at Westminster Abbey and the monarch needed another crown to wear when leaving the Abbey. The Imperial State Crown is also used on formal occasions, such as the annual State Opening of Parliament. The term imperial state crown dates back to the fifteenth century when English monarchs chose a crown design closed by arches, to demonstrate that England was not subject to any other earthly power. St Edward’s Sapphire which carries the legend that Edward the Confessor (1042-66), or St Edward, one of the last Anglo-Saxon kings of England, was asked for alms by a beggar. Carrying no money on him, the King presented the beggar with a ring. The beggar later turned out to be St John the Evangelist, who assisted two English pilgrims in Syria in gratitude for the King’s help, and asked them to return the ring to St Edward. The King was buried with the ring in Westminster Abbey in 1066. In the 12th century his tomb was opened and the ring removed. Queen Elizabeth’s Earrings, the four large pearls, have become associated with the seven pearls that Catherine de Medici received from Pope Clement VII on her marriage to Henri II of France in 1533. She later gave them to her daughter-in-law, Mary, Queen of Scots, and after her imprisonment they were allegedly sold to Elizabeth I. Elizabeth is unlikely to have worn them as earrings, as she preferred to wear pearls scattered over her ruff, on her hair or on her costume, and despite this romantic tale it appears that at least two of the pearls did not enter the Collection until the nineteenth century. The Stuart Sapphire, which has also been drilled in its history for use as a pendant, is approximately 104 carats. It is traditionally thought to have been smuggled by James II, when he fled England in December 1688. He passed it to his son Prince James Francis Edward, ‚the Old Pretender‘, and it eventually came into the collection of Henry, Cardinal York. When an Italian dealer, Angioli Bonelli was sent on behalf of George IV to retrieve any remaining Stuart papers, after the Cardinal’s death, he encountered a Venetian merchant who produced a large sapphire, saying that it belonged to the Stuart Crown. Bonelli purchased the sapphire and returned it to Britain. George IV certainly believed it was the Stuart Sapphire and by the time of Queen Victoria’s coronation it was set into the front of the band of her State Crown. It was moved to the rear of the band in 1909 to make way for the newly acquired Cullinan II. Cullinan II, or the ‚Second Star of Africa‘, weighs 317.4 carats. It is the second largest stone cut from the great Cullinan Diamond, the largest diamond ever discovered. It was found in 1905 by Frederick G.S. Wells, at the Premier Mine, about twenty miles from Pretoria in South Africa. The stone, which weighed 3025 carats, was named after Thomas Cullinan, the Chairman of the Premier (Transvaal) Diamond Mining Company. The diamond was presented to Edward VII in 1907 as a symbolic gesture to heal the rift between Britain and South Africa after the Boer War. It was formally handed over to the King on his birthday, 9 November 1907, at Sandringham. The stone was cut by Asschers of Amsterdam. Nine large stones were cut from the original diamond. The cutting and polishing took three men eight months to complete. A further 97 small brilliants and some unpolished fragments were also created. The largest cleaving of the stone, Cullinan I, the Star of Africa, was placed in the Sovereign’s Sceptre – see above-, and Cullinan II – see also above- placed in the front of the band of the Imperial State Crown. The remaining numbered stones were mounted as jewellery (and do not form part of the official Crown Jewels). Commissioned for the Coronation of King George VI on 12 May 1937, from the Crown Jewellers, Garrard & Co.
On June 2nd 1953, on one of the coldest June days of the century, after 16 months of planning, Her Majesty the Queen set out to be crowned at Westminster Abbey, watched by millions of people throughout the world. A ceremony dating back more than 1000 years was to mark the dawn of a new Elizabethan age. Now, in what has become the longest reign of any British monarch – 65Years! , the Queen shares her memories of that day as well as the coronation of her father, King George VI, in 1937. Exploring the role and symbolic meaning of the Crown Jewels in the centuries-old coronation ceremony, The Coronation shows these objects of astonishing beauty in new high-resolution footage. A combination of HD cameras and special 4K lenses reveal the incredible secrets and forensic details of a set of regalia that have a rich history of their own. Amongst the many glorious objects revealed, the film tells the extraordinary story of St Edward’s Crown, which was destroyed after the English Civil War and remade for the coronation of Charles II in 1661. 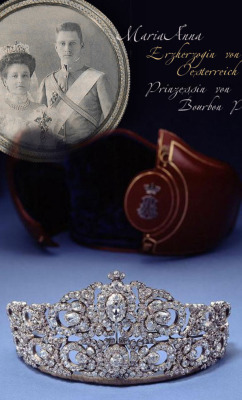 It has only been worn by Her Majesty once, at the moment she was crowned. Shedding an entirely new perspective on this world-famous event, The Coronation brings together, the eyewitness accounts of those who participated, including the maid of honour who nearly fainted in the Abbey and the 12-year-old choirboy who was left to sing solo when his overwhelmed colleagues lost their voices. Viewing rarely seen private and official film footage of the day, Her Majesty the Queen recalls the day when the weight of both St Edward’s Crown and the hopes and expectations of a nation recovering from war were on her shoulders, as the nation looked to their 27-year-old Queen to lead them to a new era. Using the Queen’s recollections and new footage of the Crown Jewels, The Coronation reveals the story of this glittering ceremony.